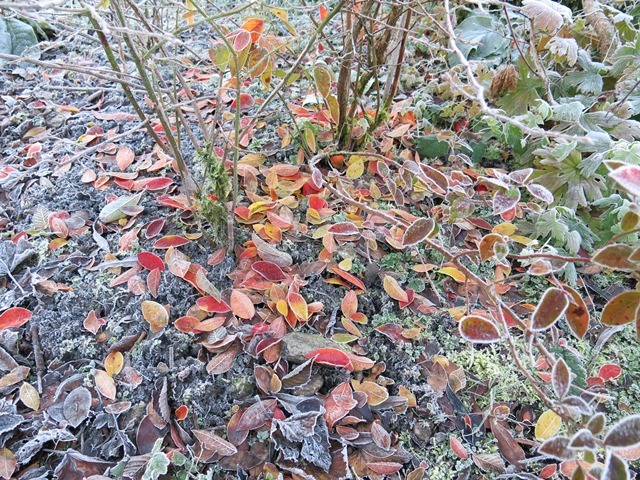 It seems to me that this year we are having the best autumn since moving to Ireland thirteen years ago. With the weather quite dry, the leaves are not turning to their usual brown mush as soon as they are falling off the trees. 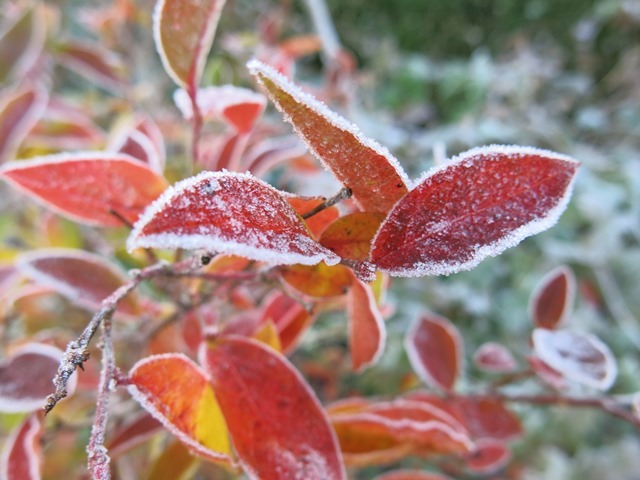 Instead they have shown a bit of colour, are staying on the trees and shrubs longer, and when they do fall, they lie crisply on the ground. 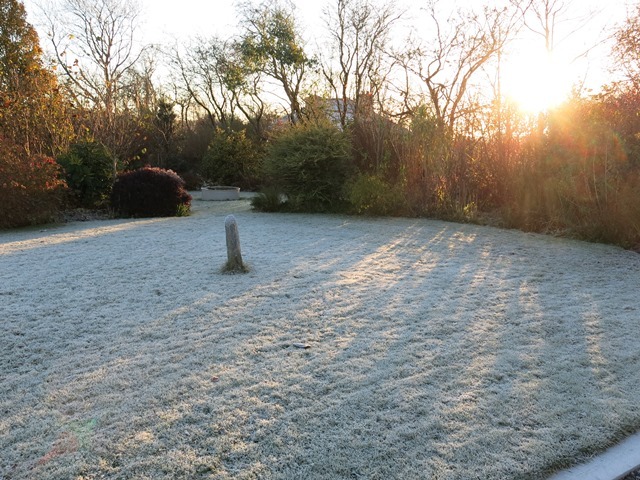 We have seen a good bit of sunshine, too! 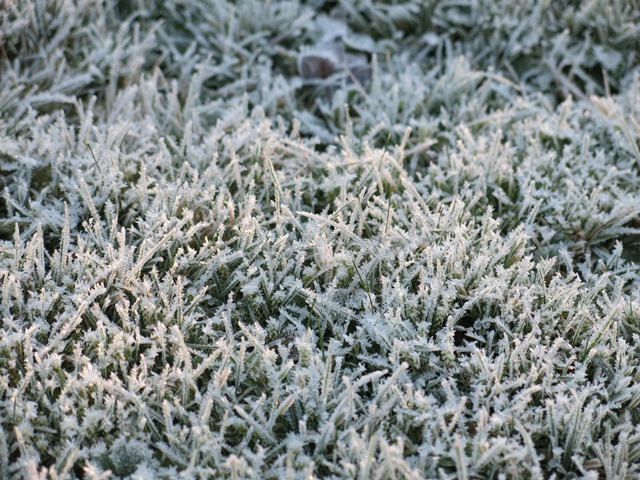 Even the grass looks good with a layer of hoarfrost! 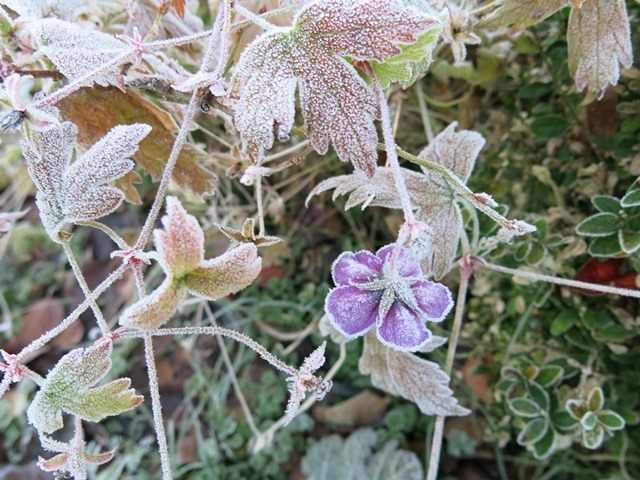 The last flowers of Geranium "Ann Folkard" will not last much longer. 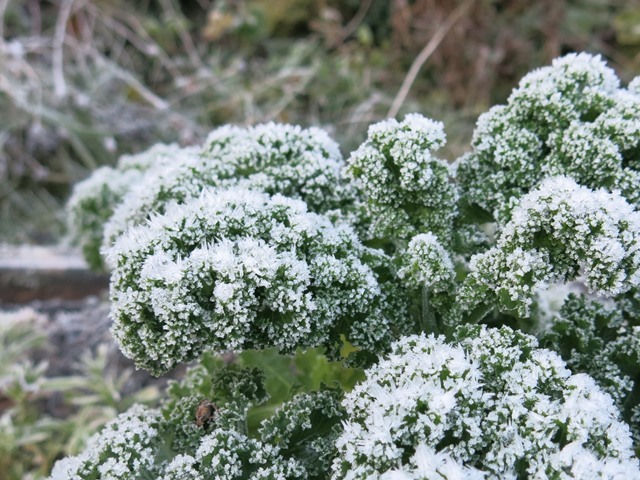 And the kale will be much tastier after this spell of frost! 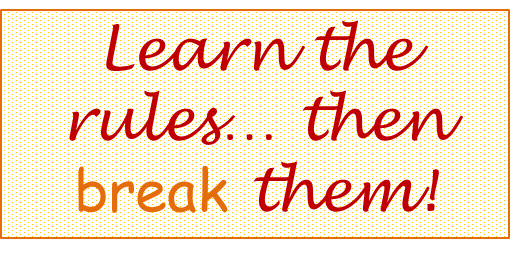 ...and those that remain are rimmed with ice. 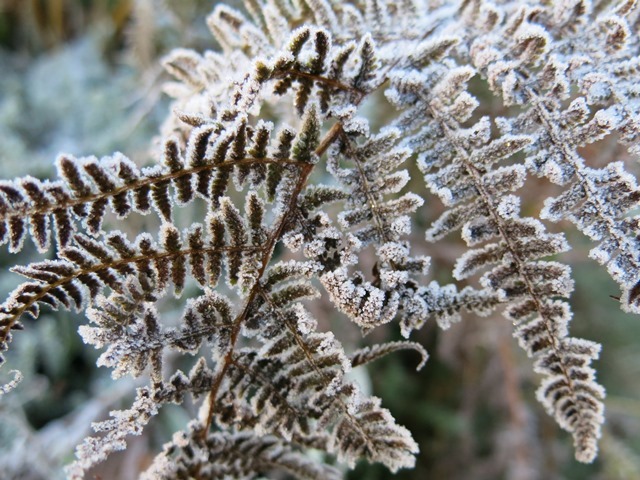 Even the died and brown fern leaves are so pretty with some white details! I have a busy day ahead, but I find it always worthwhile to take some time to enjoy the beauty that's around us. I hope you enjoy it, too! 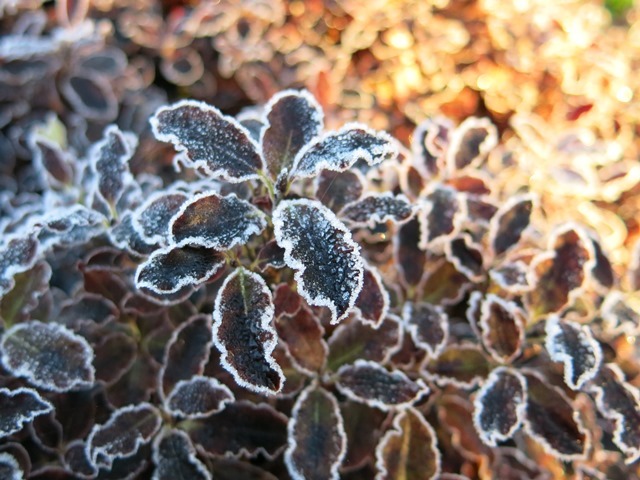 Have a good day, and stay warm! In general, I am not one of those people getting ready for Christmas months ahead. I refuse to buy sweets and decorations in September. I race past the Christmas displays in the supermarket without looking in October. In November, I try to not listen (and secretly sing along) to the piped Christmas songs in the shopping street. I am no Grinch, I do like Christmas. But I prefer it to stay something a bit special. Not something that we are so familiar with for so many months of the year that it doesn't seem like a special occasion at all any more. 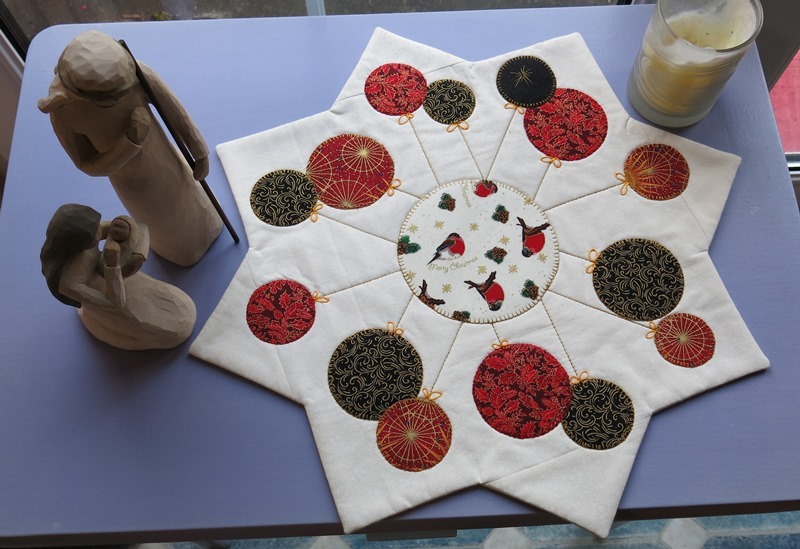 Last year I got sewing in time because of my guild's Christmas challenge, and I made the eight pointed star table centre (read about it HERE). 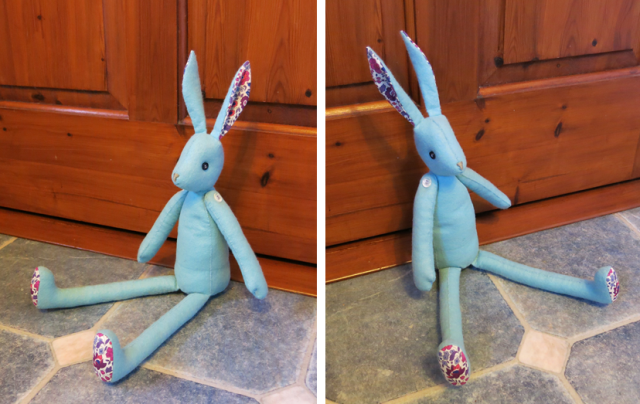 This year I did properly write up the instructions for it into a free pattern. What makes me hesitate now is the idea that once it is made it will be stored away for most of the year... Unless I will change my ways, and start decorating for Christmas months ahead??! 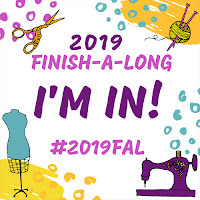 For now, I'm off to sew, of course! 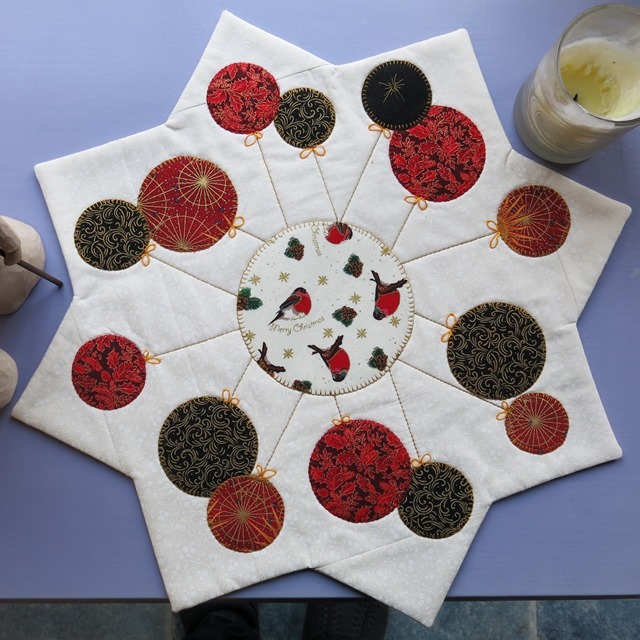 Last year, not long before Christmas, I made a star shaped table centre with appliqué for a guild challenge. At the time I wrote a image-filled description for it on the blog. This year I have revisited the tutorial, improved the photography, and converted it into a "proper" pattern! 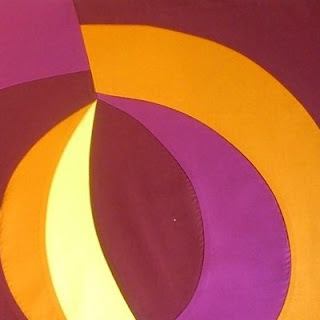 The pattern explains how to make your own table centre with appliqué. 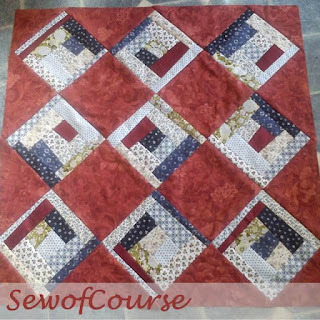 With easy step-by-step instructions, the pattern guides you to make the basic eight-pointed shape, add fused appliqué decorations, and finish with an easy backing method. There is also a table with cutting measurements for different sizes of table mat, from coasters to a giant table covering. The very best of it: The pattern is now available as an immediate PDF download on Craftsy. So anyone looking for an effective present, or a new decoration for your festive table, do check it out! And if you want to know how I did with the challenge, that story can be found HERE. Sometimes you know of someone having a difficult time, and you really would like to give them a hug. Tell them you're thinking of them, hoping with them that everything will be okay soon. Listening to their story. Being a friend. Sometimes you are physically too far apart to act on that, so what does a quilter do? I am not always great with words, but this is why I love to sew. After all the excitement of Luna, her cousin Lily and the filling of a wardrobe it was time to do something else completely! So, time being short, I chose to try carving my own stamp from a large eraser (locally called a "rubber"..!!) wielding a lino cutter from my childhood - never much used at the time, or at least I don't remember! I decided I had to keep it simple and drew several ideas on paper, choosing the very simplest in the end. 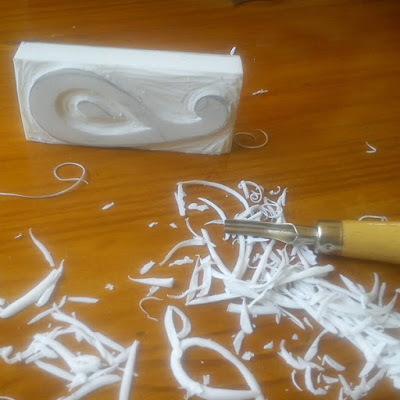 The cutting was easier than expected, and soon I was ready to have a go at printing. 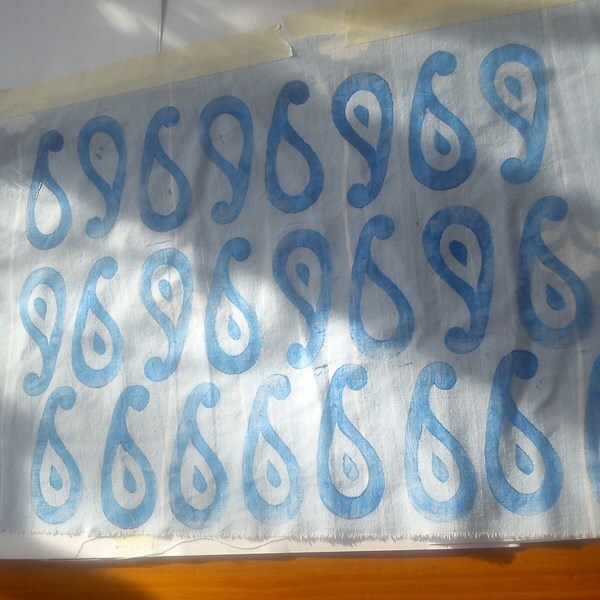 To make things easy on myself again, and to limit the experiment to the process of printing itself, I used ready made acrylic paint for fabric. 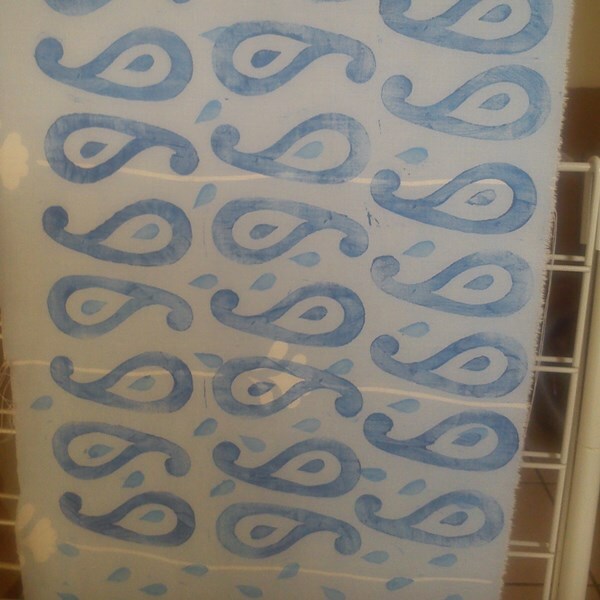 After testing the stamp briefly on paper to check the image, I got going on a piece of old cotton fabric. Since it had been washed a million times in its previous life, I felt I did not need any pre-printing preparation to the fabric. I also would not have been upset if I'd ruined the fabric completely with my experiment. 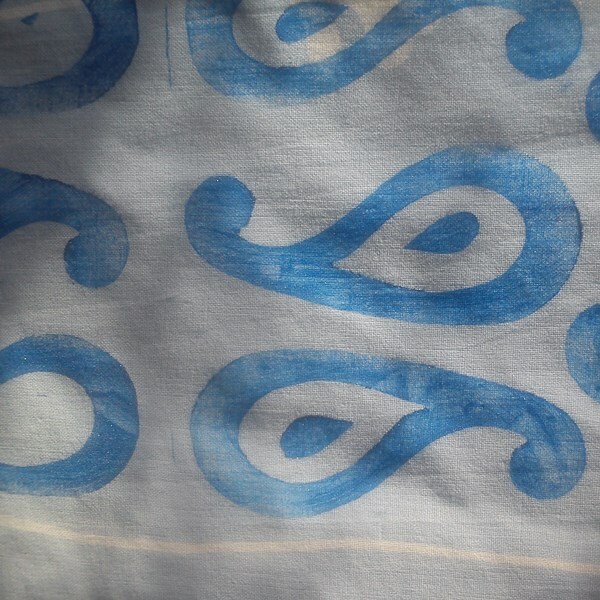 The disadvantage was that it already had a print on it, though being light blue with mainly a white squiggle line, I did not think it mattered too much. 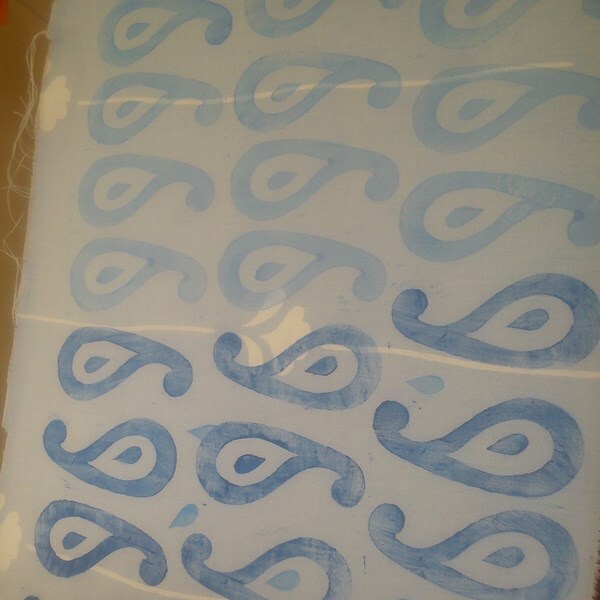 I did choose to print using blue because of the fabric being light blue, though. I intended to pour the paint into a small tray to be able to dip the stamp into to load it up. However, there is not that much paint in the small pots, so I decided to paint it onto the stamp with a brush instead. This worked brilliantly, soon I had found the right light touch to get a good print. 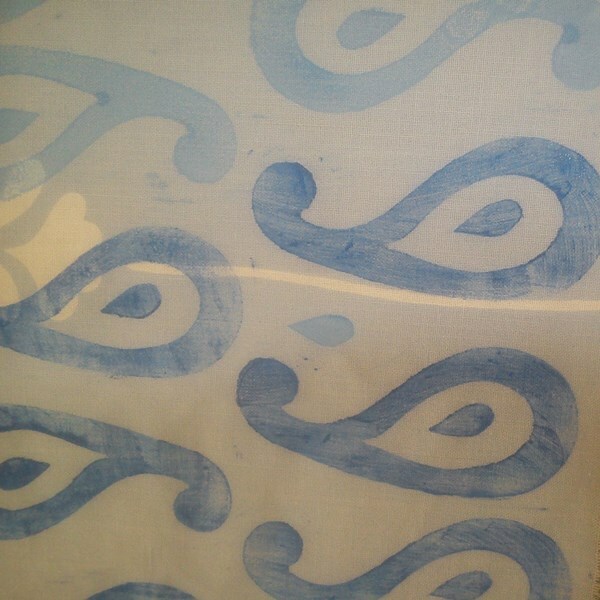 A light covering of the stamp with the paint gave a good print, and left the stamp virtually clean after each printing. As you can see, using a brush for loading the stamp gave the prints an obviously "brushed" look, but I think it added to the charm. Obviously, there is much room for improvement, but this first step has set me on the path of exploration of printing with stamps, and printing in general. I am sure much more time will be pleasantly spent playing with this! 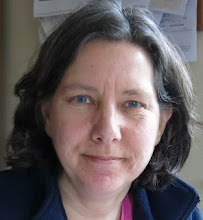 Thank you for challenging us and gently pushing us to explore, Julie! Even though the linkup has come to an end, I hope there will be many ways in which we can encourage and challenge ourselves and each other in this creative online community! 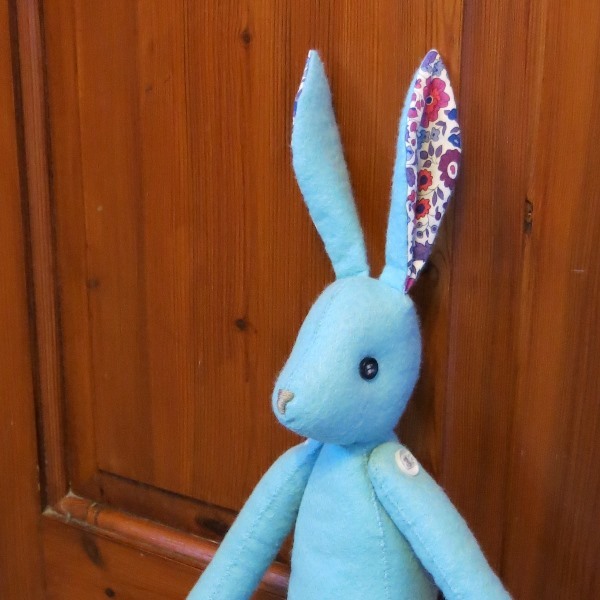 In my previous post I introduced Lily Lapin, who got comfortably settled in my Studio recently. Lily is a cousin of the well known Luna Lapin, and just like her cousin she is a talented sewist/seamstress, and loves to make her own clothes. 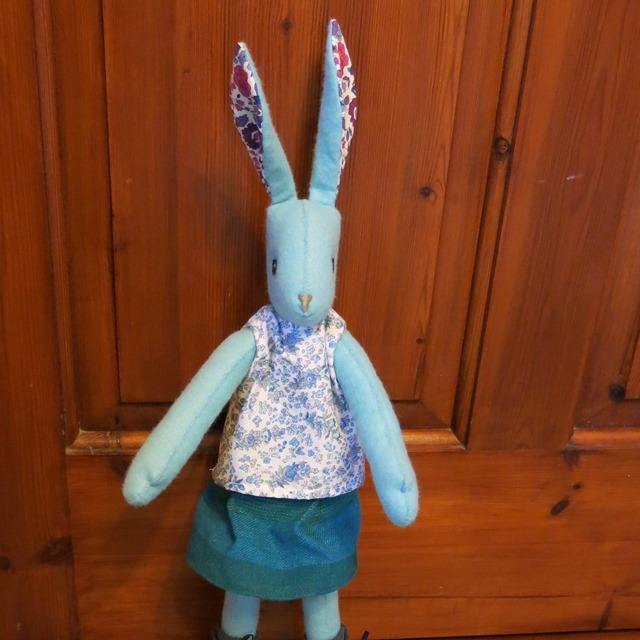 So it was very fortunate that Sarah Peel, the creator of Luna, has written the book "Making Luna Lapin" with patterns and instructions for a wardrobe for Luna. After happily making Lily herself from the pattern in the book, making clothes for her was also a joyful project. 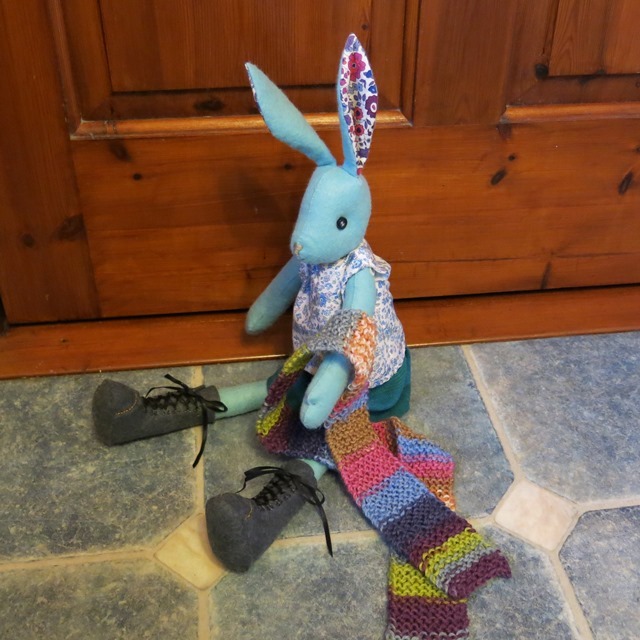 I had been asked to make a piece of rabbit/hare clothing for the blog hop around "Making Luna Lapin", but of course I could not stop at just one. 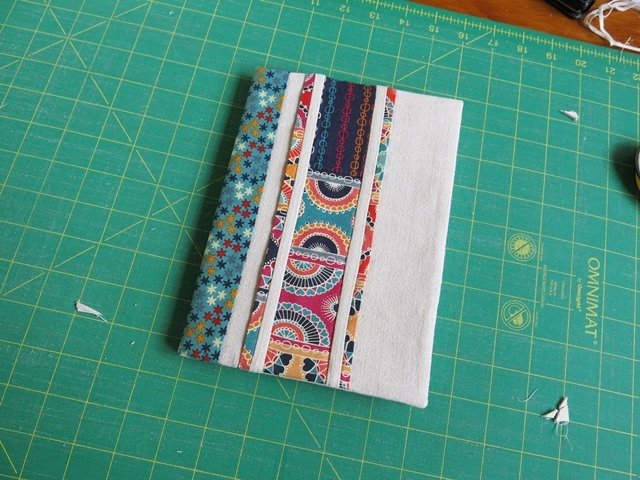 And the book has so many patterns to choose from! 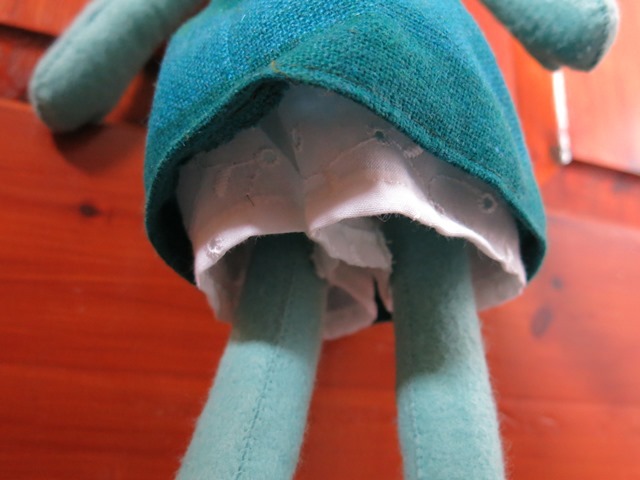 I started with making Lily a pair of French knickers. The pattern specified the use of lace, but since I did not have any to hand I added a small seam allowance to the pattern pieces and used a remnant of pretty cotton instead. At least she was decent if ever her skirt would lift a little. Then I went on to make Lily a tweed skirt. It went together so quickly and easily, I am tempted to make several versions of this! To go with the skirt I wanted to make a top. I wanted to use a lovely piece of liberty fabric, so I hemmed the fabric first and used the pattern for a lace top. I did use a lining (very light though) as was described for the lace top, because that makes it easier to finish the edges around the neck and arms. Both the skirt and top close at the back with small poppers. Of course an outfit like this is not complete without boots, and yes, the book includes patterns for shoes and boots, too! 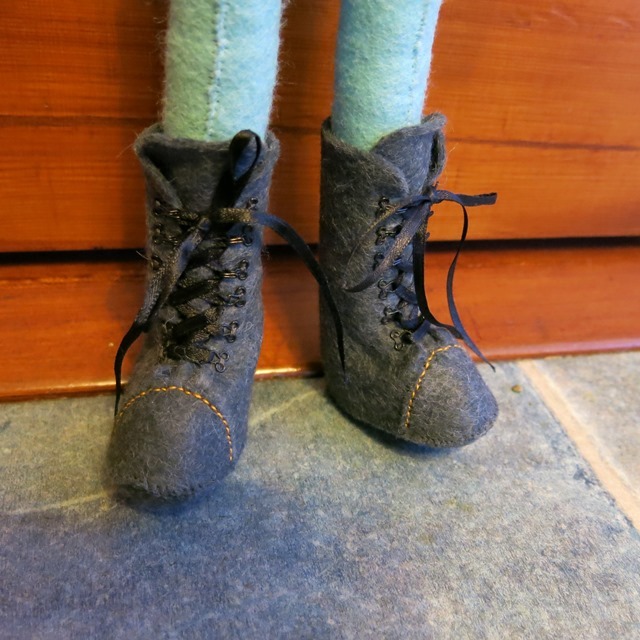 I used the pattern pieces to create some well-fitted boots, though I did change the way they close up. I used hooks and eyes to guide the ribbon laces instead of threading them through the felt as the pattern instructed. Aren't they just gorgeous?! If you are interested in making your own version of Luna, the book (available as e-book, which I used, or paperback) is great. 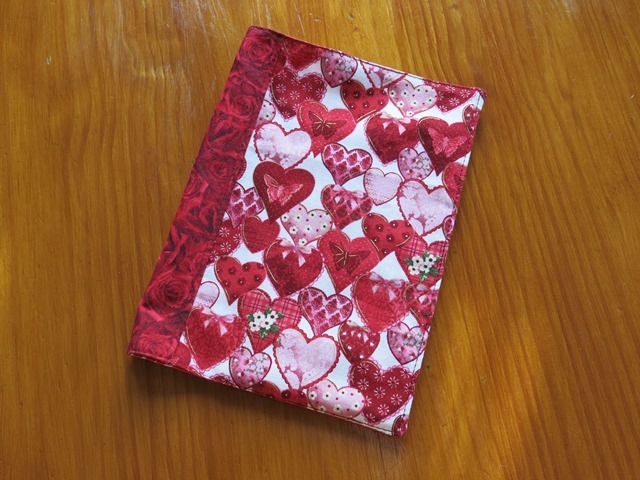 The patterns are all printed FULL size in the book, and stories about Luna are included, too. A preview of the book can be found towards the end of this post. 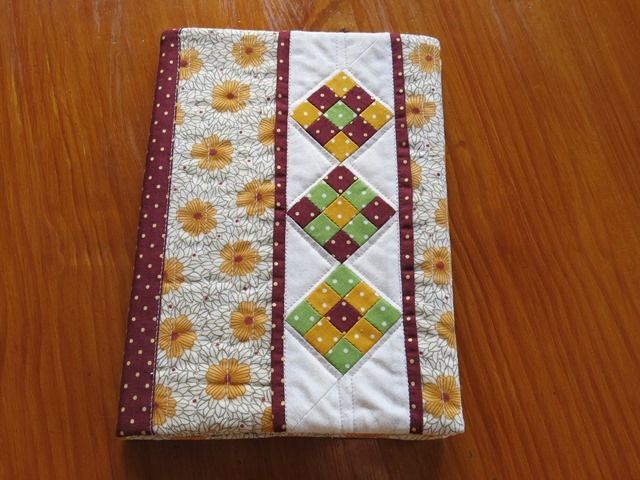 The book includes chapters on materials and techniques used, and the instructions with each pattern are described step by step. 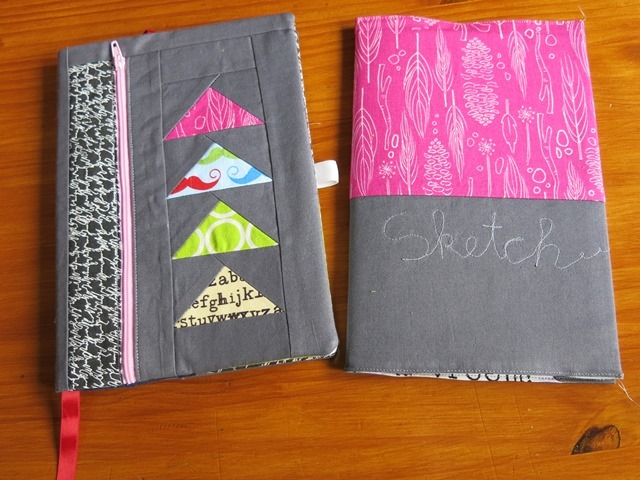 A beginner should take their time over these projects (sewing small can be tricky! ), but a more experienced sewist should be able to use the patterns as a basis to give Luna (or her cousin) a wardrobe to be proud of. I think there may be more dress making in Lily's future! 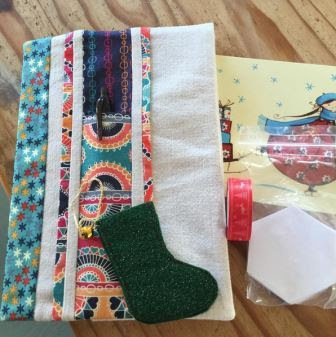 - from a patchwork scarf to boots and shoes. There are also patterns to dress Luna's brother Alfie in jeans, shirt and a waistcoat, an armchair for Luna to sit in, and of course the pattern for Luna herself is included, too! I'm off now to work on a different project, I hope to show that next time. This is also #2 goal in my Quarter 4 finishalong list, I will be linking it up at the the end of the quarter. Have you ever heard of the sweet Luna Lapin? "Luna Lapin was a quiet and kind rabbit. All rabbits are quiet, so it was not this that made her exceptional. What made Luna exceptional was the way she always said hello to passers-by and of course, her impeccable taste." 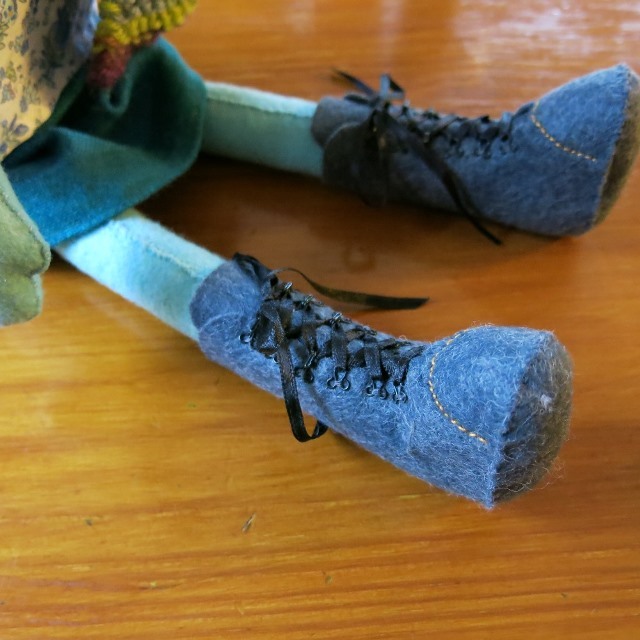 Luna likes to read and draw, but more than anything she loves to sew, especially clothes! She is the creation of Sarah Peel, and if you want to make you own Luna, kits are available on Sarah's Coolcrafting website (or, read on...). Luna's wardrobe has gradually been filling with some lovely outfits as well, and now Sarah has written a book called "Making Luna Lapin" - preview at the end of this post - with patterns and instructions for Luna's clothes (and some for her brother Alfie), including the pattern of the stylish rabbit herself, of course. 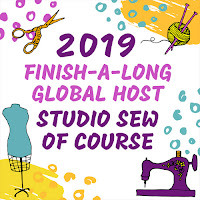 To celebrate the book (e-book and paperback versions), there will be a celebratory blog hop at Sew and So at the beginning of November. I have been asked to be part of the blog hop, so I thought it was high time to get acquainted with a more local cousin of Luna, who has been named Lily! Lily is a full cousin of Luna and was created in my Studio, here in rural Ireland. Since Lily came to life in the green land of mists, mysteries and fairies (and dare I say it, leprechauns...), she has a touch of magic, too. This is quite obvious when you look at her closely: She has an unusual light blue skin tone and a rather pale nose, as well as dark and mysterious eyes. Of course she shows many similarities to her famous cousin, too: Have a look at her gorgeously bright Liberty inner ears, for example! Even though the photos suggest otherwise, Lily didn't have to show much skin for long, don't worry. If nothing else, it would be much too cold for that! Fortunately, she has also inherited Luna's interest in sewing, and loves to make her own outfits! In her inspirational studio (or more fanciful "atelier", as the more elegant French Lapin relatives like to call it) she has developed a flair for sewing tasteful clothes with the help of Luna's book, and so her wardrobe is gradually filling up just like Luna's. 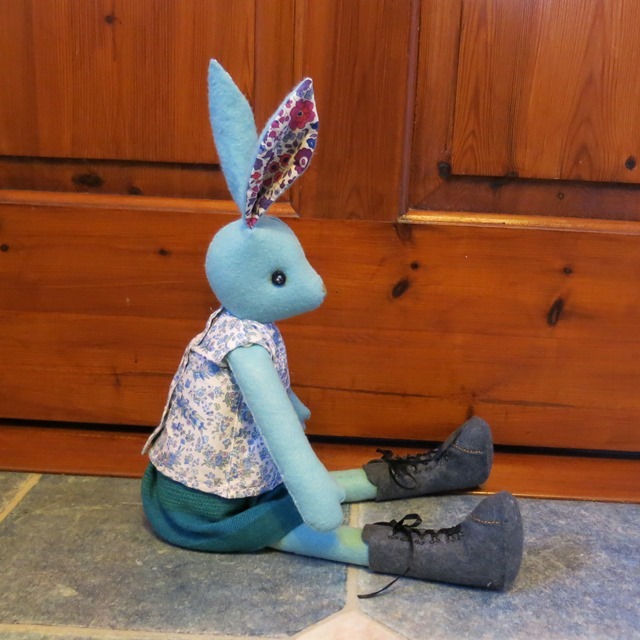 With the help of "Making Luna Lapin", a lot of sewing (and some knitting) has been going on, and a complete outfit for Lily has been created! However, more details on all that will have to wait till it is my turn on the blog hop next week. I hope to see you there! 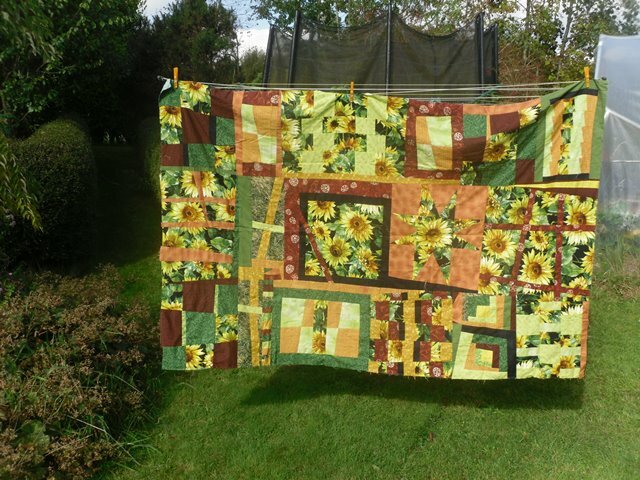 edit: see the clothes I made at "the wardrobe of Lily..."
And I'm off to sew, of course! The drunkards path blocks have been transformed into a quilt top, and I have progressed so far that I thought that I would manage a finish in quarter 3. It will surely be done in this last quarter of 2016. 2. Working on a non-quilt project, too. The project in this lovely basket (basket described in a previous blog post) has a deadline, and definitely will be done soon! 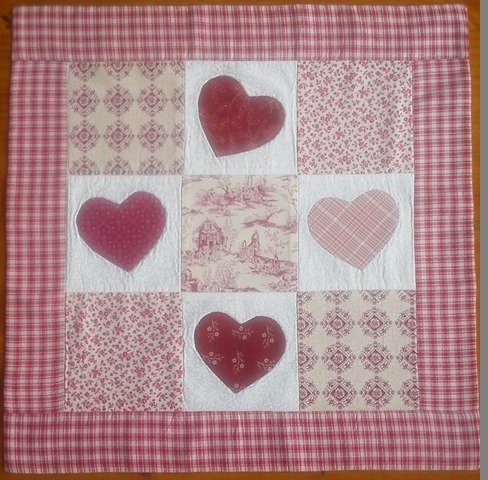 The quilt top from (More) Hearty Good Wishes fabrics and sashiko-stitched linen is now finished. It needs to be quilted and bound. If I keep it in the list, it will be finished one day, right?! 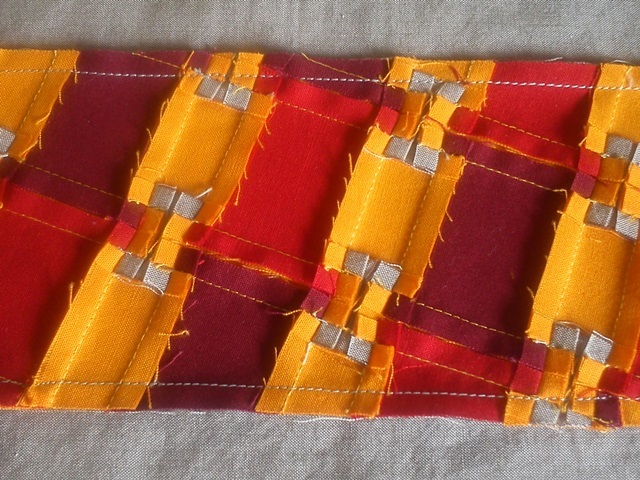 Every quarter some quilting stitches are made in this one, slow going though! Rolled over from last quarter, still working on it. 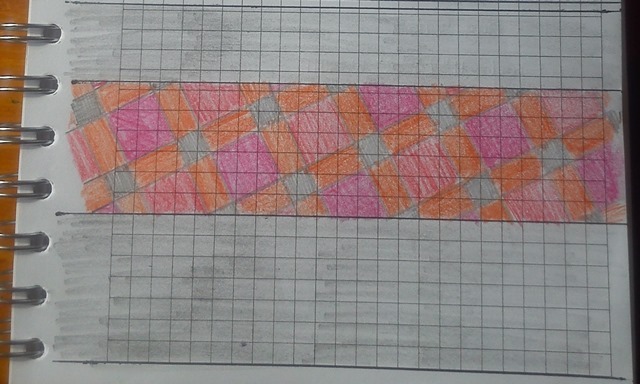 Not worked on this at all in quarter 3, time to finish it though, it's so close! 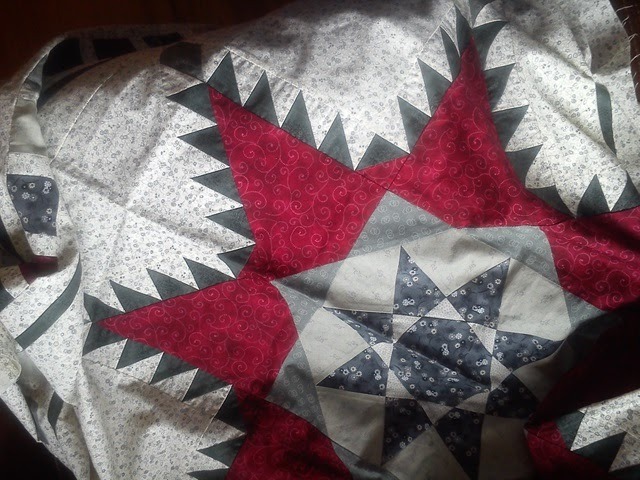 The top is (probably) finished, time to turn it into a quilt. Another top ready for quilting! As you see, more than plenty to be getting on with! 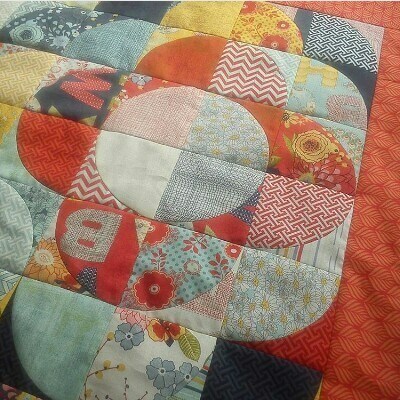 Linking up with the Quarter 4 Finishalong! 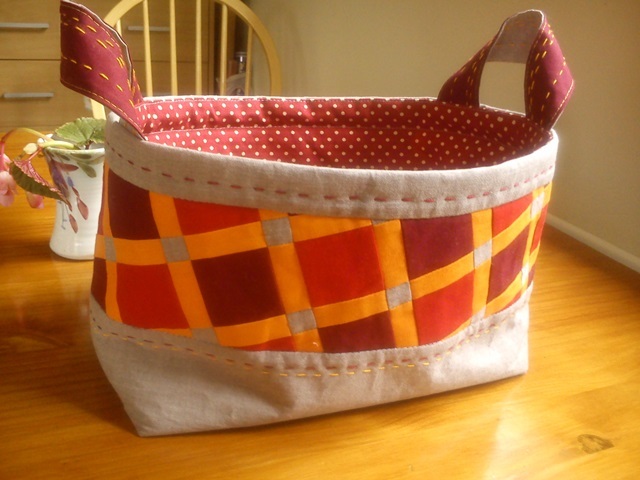 At the beginning of the month I showed you the One Hour Basket that I made for the Modern Quilters Ireland summer swap. I also told you how happy I was with my make. 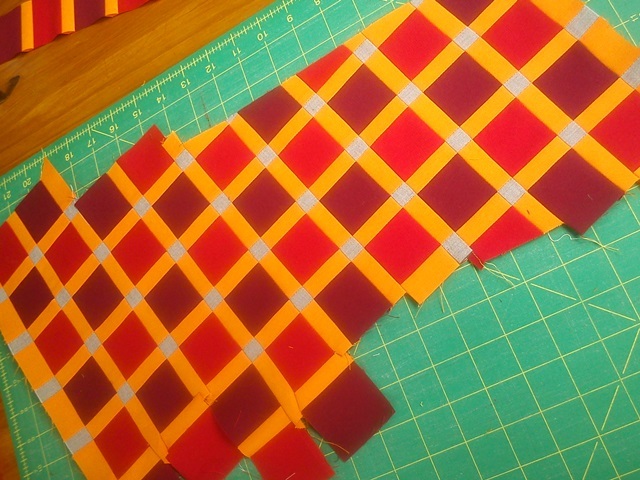 I even wrote a tutorial on how to make a tartan panel like the one I used for my basket. But in all that I did forget about receiving!! Of course I was one of the partners, too. Putting up my mosaic. Stating my likes and dislikes - this also wasn't done without a lot of thinking. This time about how to describe accurately what I do and don't like, but at the same time not putting my partner into a spin with (perceived) critical demands... Oof!! Anyway, of course it all came right in the end. I did receive a basket for myself. And it was PERFECT for me! Thank you again, Beatrice @frogsandsprogs!! I love the colours, the prints, the structure. And the cards and scraps were just brilliant! Recently, I have made my own version of the 1 hour basket. A (free) tutorial for the 1 hour basket can be found HERE, and as the title says it is a fast make. 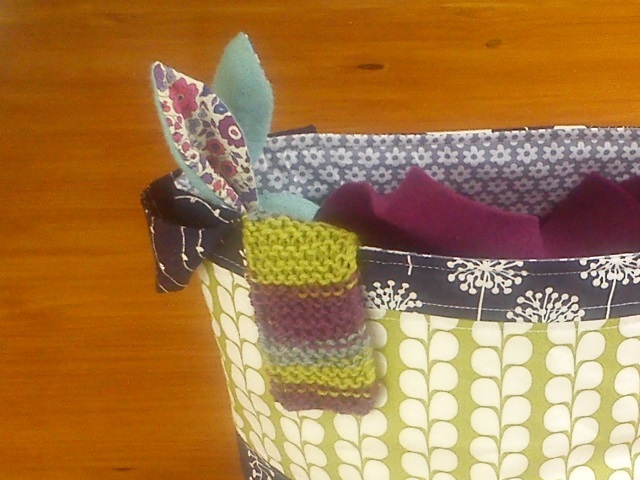 The basic basket uses just two fabrics, one for the outside, one for the lining, and construction is straightforward. I would think most (somewhat) experienced sewists would indeed make such a basket quickly, if maybe not quite in one hour. 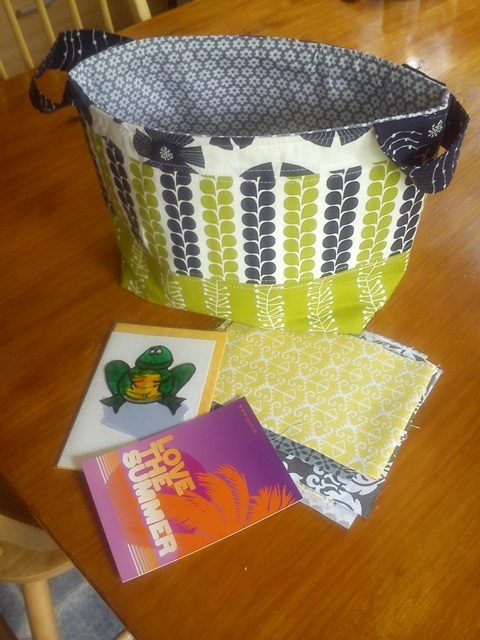 For the recent Summer Swap organised by the Modern Quilters Ireland it was decided that we were making a 1 hour basket for each other. Of course (!) I am not one to make a simple basket, though. 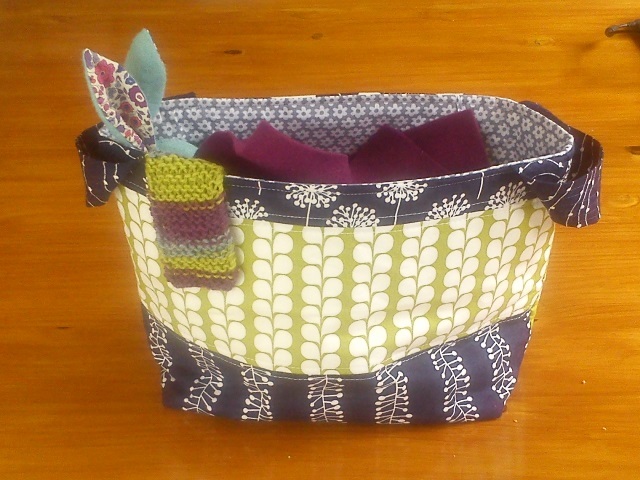 My partner indicated a few of her likes, but I found it very hard to decide what to do to make the basket interesting. I then worked out how to go about sewing it. Strip piecing was the obvious solution since I didn't fancy sewing each individual little piece for fear of losing it (down the throat of the machine even! ), or losing track of where each piece was to go. 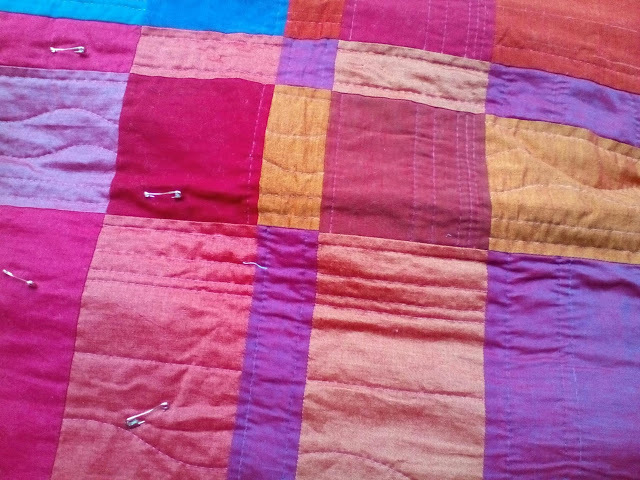 Unpicking such tiny pieces would result in having to throw them away and cutting anew, too. 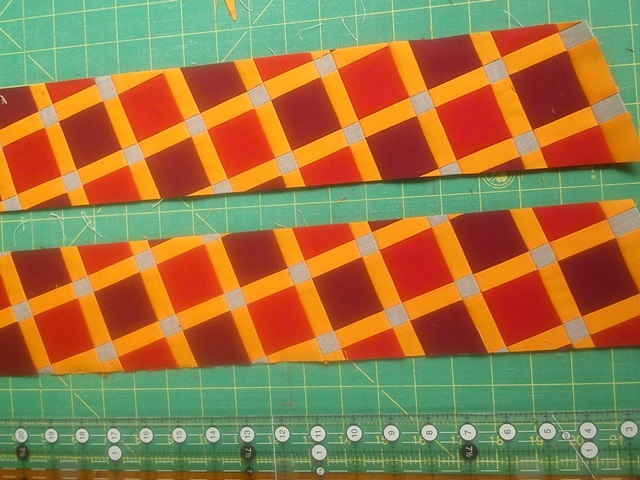 In this case the left strip set was with 1" grey strips and 2" yellow strips (cut sizes), and the right strip set was made with 1" yellow and 2" red strips, using alternately a dark and a lighter red. Then the sets were cross-cut, and sewn together again into a large panel. 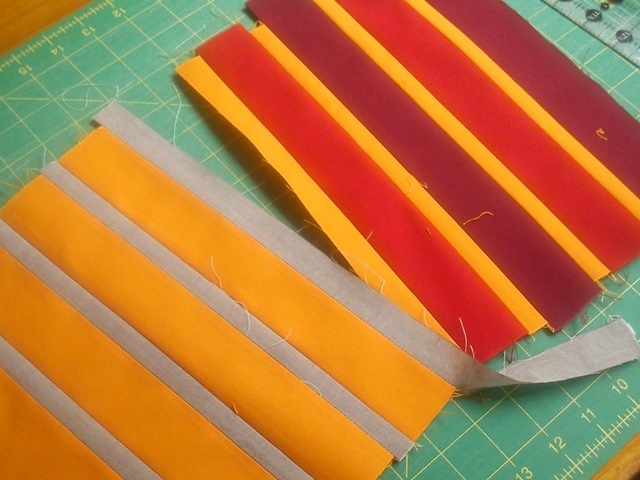 The yellow/grey set was cross-cut 1" wide, and the yellow/reds set was cross-cut 2" wide. Pressing in between the construction steps was absolutely essential. 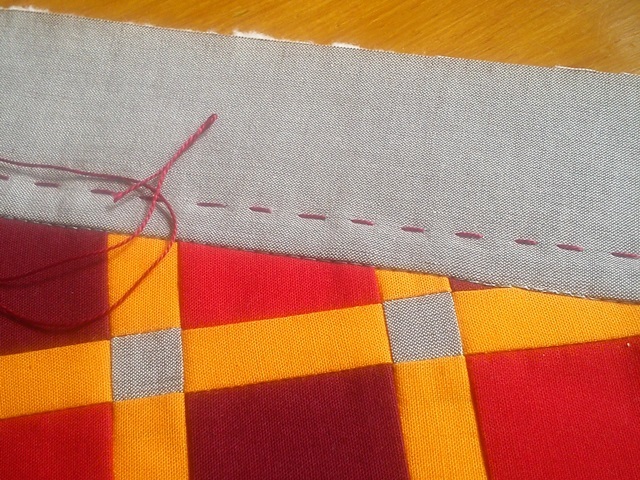 At first I thought that opening the seam allowances would be best, since it would reduce bulk. 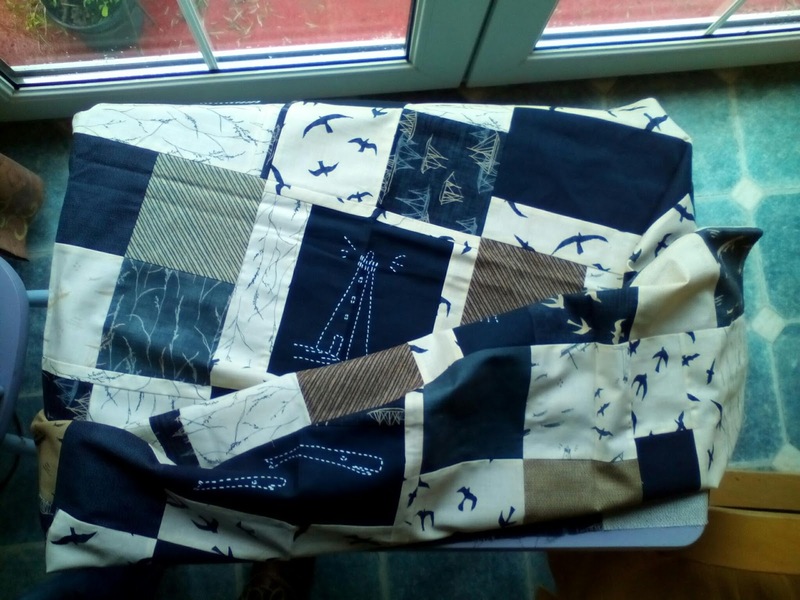 But after sewing only one cross seam I had to conclude that it was near impossible to match the cross seams that way (that was the only time that the seam ripper came out). 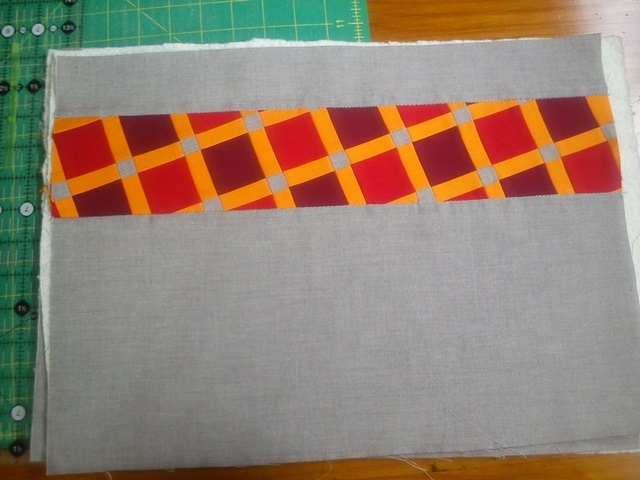 So I went back and pressed my seams alternately left and right for one strip set, and alternately right and left for the other strip set. This made my seams nest perfectly, just what I wanted! 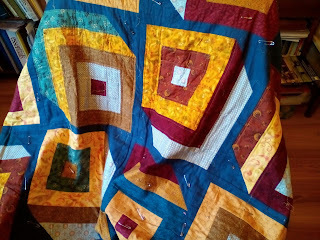 After sewing the cross seams I went back and alternated the direction of the seam allowances in each cross patch, making sure that the seam allowances at each corner were lying in a circular direction. A lot of fiddling, and precision pressing, but perfect results! The pieces for the basket were only cut to size after the stitching was finished, though I left the last hand stitches at the very edges of the pieces until after they were trimmed to avoid cutting through the thread! Putting the basket together after all this was a very quick job in comparison! I was so happy with the result that I found it hard to send it on its way, but I can tell you that my partner was very happy to receive it, and that's what it's all about isn't it?! Though I may have to make another one to keep!